THRIVE Ham TVP is a low-fat and vegetarian alternative to real ham. Scramble it up with eggs or add it to a mixed summertime salad. A #10 can contains 44 servings and has a shelf life of up to 10 years. Enjoy the ease and safety of THRIVE Ham TVP, which is free from the dangers of E. coli, salmonella, and other contaminants that can be present in real meat. These small, crumbly bits will be versatile and shelf-stable for up to a year after opening, and your family will love the authentic taste and texture. 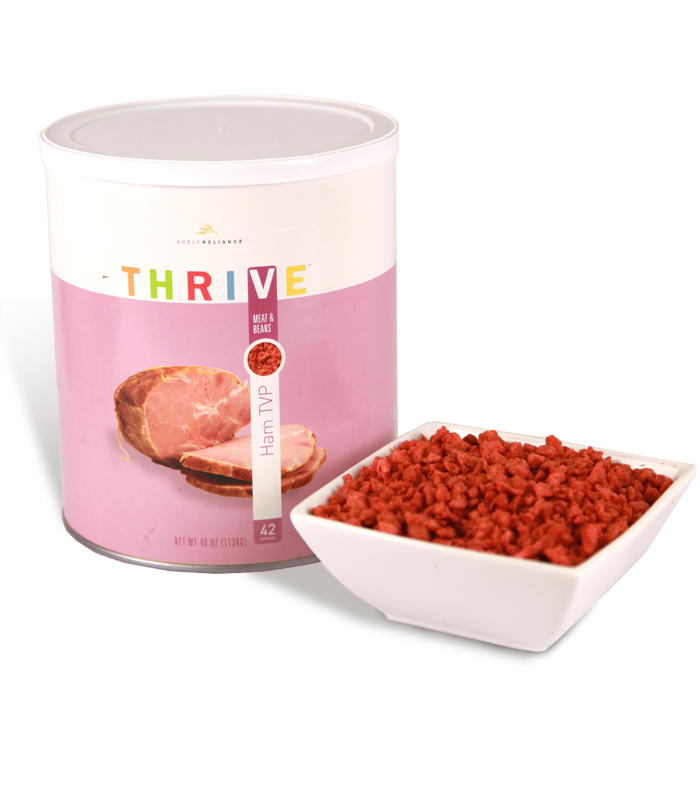 Supplement your next ham-based dish with a little THRIVE Ham TVP, and see what we're talking about! TVP (Textured Vegetable Protein) is an excellent protein source that is easy to store and use. TVP is made from soy flour that has had the soy oil extracted. It is cooked under pressure, then extruded and dried. TVP is high in fiber and lower in fat than authentic meat, making it ideal for food storage and everyday use. Because TVP is not made from meat, it does not run the same contamination risk from bacteria such as E. coli and salmonella. TVP is soy based and perfect for those on a vegetarian diet. Textured vegetable protein (soy flour, red 3), soybean oil, water, salt, hydrolyzed corn-soy-wheat protein, brown sugar, autolyzed yeast extract, smoke flavoring, artificial flavoring, thiamine hydrochloride, dextrose, partially hydrogenated cottonseed oil, disodium inosinate, disodium guanylate, spice extract.